China is a case of bastardized socialism on credit steroids. At the turn of century it had $1 trillion of credit market debt outstanding----a figure which has now soared to $25 trillion. The plain fact is that no economic system can remain stable and sustainable after undergoing a 25X debt expansion in a mere 14 years. But that axiom is true in spades for a jerry-built command and control system where there is no free market discipline, meaningful contract law, honest economic information or even primitive understanding that asset values do not grow to the sky. Nor is there any grasp of the fact that the pell-mell infrastructure building spree of recent years is a one-time event that will leave the economy drowning in excess capacity to produce concrete, steel, coal, copper, chemicals and all manner of fabrications and machinery, such as backhoes and cranes, which go into roads, rails and high rises. The borrowing, building and speculating mania in China has obviously gotten so extreme that even the new regime in Beijing has been desperately trying to cool it down. But this will end up as a catastrophic failure---not the "soft landing" brayed about by Wall Street bulls who do not have the slightest comprehension of the difference between free market capitalism and the phony "red capitalism" that has been confected by the party-controlled apparatus of the massive, intrusive, bureaucratic and hierarchically-driven Chinese State. At bottom the fatal error among China bulls is the failure to recognize that the colossal boom and bust cycle that China is undergoing is not symmetrical. The much admired alacrity by which the state guided the export boom after 1994 and the infrastructure boom after 2008 is not evidence of a superior model of governance; its only proof that when credit, favors, subsidies, franchises and speculative windfall opportunities are being passed out freely and to everyone, when there are all winners and no losers ( e. g. China's bankruptcy rate has been infinitesimal), a statist regime can appear to walk on water. But what it can't do is walk the bubble back to stable ground. The boom phase unleashes a buzzing, blooming crescendo of enterprising, investing, borrowing and speculating throughout the population that cannot be throttled back without resort to the mailed fist of state power. But the comrades in Beijing have been in the boom-time Santa Claus modality for so long that they are reluctant to unleash the economic gendarmerie. That's partly because their arrogance blinds them to the great house of cards which is China today, and partly because they undoubtedly understand that the party's popularity, legitimacy and even viability would be severely jeopardized if they actually removed the punch bowl. Just look at the angry crowds which mill about when a bankrupt entrepreneur skips town and locks up his factory sans all the equipment; or when developers are forced to discount vastly over-priced luxury apartment units they sold to middle class savers/speculators; or when banks attempt to disavow repayment responsibility for "trust products" they sold out the backdoor through affiliates; or the growing millions of rural peasants who have been herded into high-rises without jobs after their land was expropriated by crooked local officials and developers trying to make GDP quotas and a quick fortune, respectively. In short, the Chinese population "can't handle the truth" in Jack Nicholson's memorable line. They by now believe they are entitled to a permanent feast and have every expectation that they party and state apparatus will continue to deliver it. As a result, Beijing has resorted to a strategy of tip-toeing around the tulips in a series of start and stop maneuvers to rein-in the credit and building mania. But these tepid initiative have pushed the credit bubble deeper into the opaque underside of China's red capitalist regime, meaning that its inherent instability and unsustainability is being massively compounded. The billiard balls that have been bouncing around the table since Beijing attempted to throttle lending by the Big State banks a few years ago provides a dramatic example. But here's the thing. The credit bubble is now migrating into the land of zombie borrowers such as coal mine operators who have always been heavily leveraged but now face plummeting demand and sinking prices owing to Beijing's unavoidable crackdown on pollution and the rapid slowing of the BTU-intensive industrial economy. Moreover, the $6 trillion in shadow banking loans are the opposite of long-term debt capital: they are ticking time bombs in the form of 12-24 month credits that are being accumulated in a vast snow-plow of maturities that will only intensify the eventual crisis. 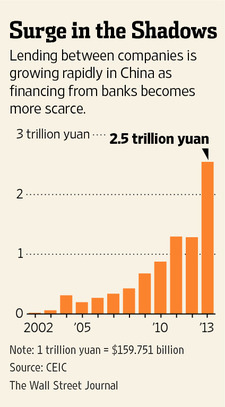 These company-to-company loans, known as entrusted lending, have emerged as the fastest-growing part of China's shadow-banking system, which provides credit outside of formal banking channels.The increase in entrusted loans last year was equivalent to nearly 30% of local-currency loans issued by banks—almost double the portion in 2012. The jump is all the more pronounced since China's total social financing, a broad measure of overall new credit, shrank 561.2 billion yuan over the same period, largely because other forms of shadow credit declined as Beijing sought to rein in runaway debt growth. The modern world of debt-besotted economies and central bank printing press dominated financial systems resolutely refuses to heed the lessons of history. But in the case of China's new up-welling of "entrusted lending" by commercial and industrial firms, the lessons are plain as day. During the final blow-off phase of the US stock market in 1928-1929, for example, margin lending nearly doubled from 5% to 10% of GDP in 12 months and the vast proportion of that expansion came from business corporations speculating with excess cash---much of it raised on the stock market! Even more to the point is the even crazier bubble blow-off in Japan during 1988-1990, which was given the name Zeitech for financial engineering. In that case corporations raised massive amounts of cash in the convertible preferred and bond market and cycled it back into the stock market on its way to 50,000. Today the denizens of Red Capitalism are just practicing Zeitech with a Chinese accent. The big non-financials are converting their cash---which should be saved for a rainy day---and their preferred access to loans from the big state banks into poker chips for speculation in a vast junk loan market that is desperate for cash. When the state runs out of will or capacity to prop-up what will be a cascading spiral of defaults in the so-called SME (small and medium enterprise) sector, the thundering crash which ensues will make the Japanese melt-down look like a Sunday School picnic. It is then that the mailed fist of the state will be called into play; the economic gendarmerie will be unleashed by the desperate comrades in Beijing; the show trials against corrupt enemies of the state will proliferate; and the streets will be filled by the masses deprived of their putative entitlement to a permanent prosperity party. Needless to say, then, too, the Chinese growth machine will come to a screeching halt.The China Miracle will be exposed. It never was one. BEIJING—With credit tight in China, companies in industries beset by overcapacity are turning to an unconventional source for cash—other companies—in a new rising risk for the country's financial system. These company-to-company loans, known as entrusted lending, have emerged as the fastest-growing part of China's shadow-banking system, which provides credit outside of formal banking channels. Net outstanding entrusted loans increased by 715.3 billion yuan ($115.4 billion) in the first three months of 2014 from a year earlier, according to the most recent data from China's central bank. The increase in entrusted loans last year was equivalent to nearly 30% of local-currency loans issued by banks—almost double the portion in 2012. The jump is all the more pronounced since China's total social financing, a broad measure of overall new credit, shrank 561.2 billion yuan over the same period, largely because other forms of shadow credit declined as Beijing sought to rein in runaway debt growth. The growing popularity of such company-to-company lending offers a fresh—and to regulators, troubling—look at the rapid buildup of debt in China. 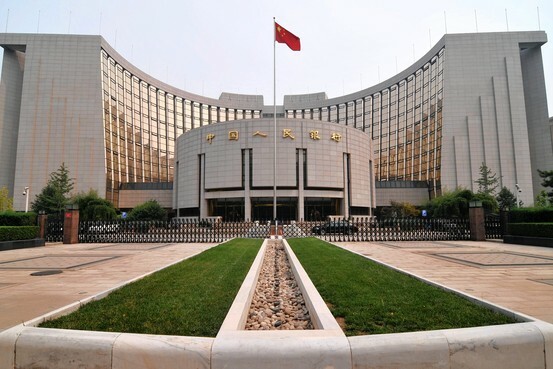 In its latest report on the country's financial stability, issued Tuesday, the central bank singled out entrusted lending as a problem, saying it is being used by banks to evade regulatory restrictions on lending. Banks, while generally not risking their own capital directly, act as middlemen in these transactions. China's debt levels have climbed in recent years at a pace similar to increases in the U.S., euro zone and South Korea before those economies fell into their most recent recessions. The concern among some economists and analysts is that debt will continue to balloon in China, exposing the country to greater financial risks as its economy slows down. Officials at the People's Bank of China, the central bank, have warned that much of the intercompany lending is flowing to sectors where the regulators have urged banks to reduce lending: the property market, infrastructure and other areas burdened by excess capacity. In central Shanxi province, 56% of entrusted loans in the past few years have gone to power producers, coking companies and steelmakers, among others, according to a recent paper byYan Jingwen, an economist at the PBOC. Access to entrusted loans allows struggling companies to hang on longer than they otherwise could, delaying the consolidation that the government and some economists say is needed in a swath of industries. Big publicly traded companies with access to credit—such as the shipbuilder Sainty Marine Corp., China Shipbuilder 002608.SZ in Your Value Your Change Short position and specialty-chemicals producer Zhejiang Longsheng Group 600352.SH in Your Value Your Change Short position —are among the most active providers of entrusted loans. These companies, instead of investing in their core businesses, lend funds at hand to cash-strapped businesses at several times the official interest rate. Companies provide funds to make the entrusted loans. To get around an official ban on direct lending to other companies, they need to use an intermediary—typically a bank—to lend the money out.